A wonderful rock formation that offers beautiful drop-offs, slopes, shallows, small caves and more, El Cristo is part of the protected marine park in Puerto Vallarta. An underwater photographer's delight, El Cristo (The Christ) is a place to enjoy wonderful varied topography and a beautiful array of marine life. 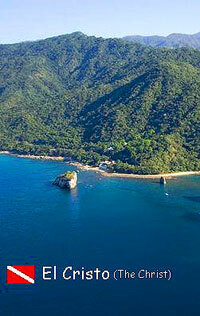 Your family can relax on Mismaloya Beach while you dive. After your dive, visit one of the beach restaurants for lunch or a drink while you tell about your experience. Combine this site with any of the other Mismaloya dives to create your own 2-tank dive! Choose from La Puntilla, Los Bajos, El Acuario, Devil's Canyon, and El Cristo. Just write your choices in the special instructions box when booking.